Don’t you feel like it’s hard to find really good, simple and delicious fish recipes? 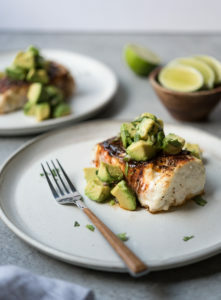 Search no more, this Spice Roasted Halibut with Avocado Salsa is LEGIT and can be pulled together in 20 minutes or less! This recipe is sponsored by the California Avocado Commission. Shall we take a moment to talk about how excited I am that it’s finally California Avocado season?!? YES! Omg and this chunky avocado salsa piled high on top of the spice roasted fish is like the perfect flavor bomb in your mouth. The creamy and tangy avocado salsa paired with the chili spiced halibut are a match made in heaven. Your taste buds will sing and dance! I love how simple the ingredients are, and you can make the salsa while the fish roasts in the oven. It doesn’t get much easier than that. Spring has sprung my friends, and it’s all about the freshness! I’ve partnered with my friends at California Avocados to bring you this perfect transition to spring dish. I can’t wait for all of you to try this recipe and get a real taste of California! You can thank me later. ???? Tangy Avocado salsa served over a simple spice roasted Halibut that can be made in 20 minutes or less. Preheat the oven to 400 degrees. In a bowl, combine the salt, pepper, garlic powder, paprika and chili powder. Lightly spray the halibut with olive oil. Coat the fish on all sides with the spice mixture then place on a parchment lined baking sheet, or a lightly greased baking dish. Bake for 15-20 minutes, until fish flakes easily with a fork. While the fish bakes, make the avocado salsa. Add the diced avocados, red onion, jalapeño, lime juice, salt and cilantro to a bowl and toss well. When fish is done baking, serve with avocado salsa on top and enjoy! Loved this recipe! So simple yet full of flavor. Your recipes never disappoint. Thank you!!! Thank you Teri!! One of my favorites too!